Two Vietnamese frigates are on their way to China to attend an international naval parade on April 23. 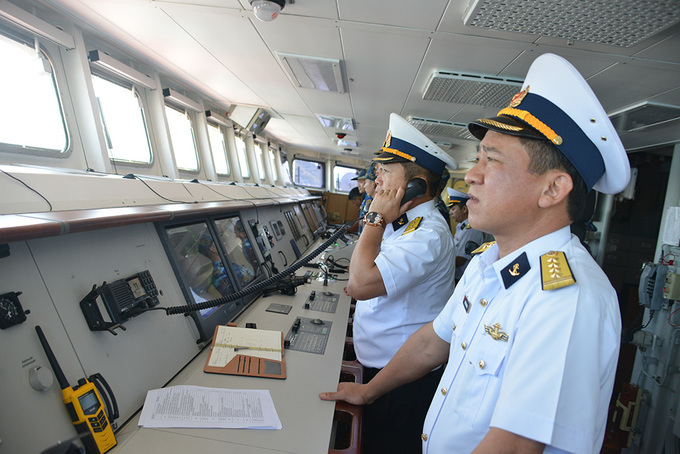 The 011 Dinh Tien Hoang and 015 Tran Hung Dao vessels left Cam Ranh Bay in the central province of Khanh Hoa Sunday for a voyage of 3,600 sea miles to attend the event in the Yellow Sea off Qingdao City in eastern China. Led by Colonel Nguyen Dinh Hung, Commander of Naval Region 4, which is in charge of waters off Vietnam’s south-central coast, including the Spratly Islands, the Vietnamese delegation includes representatives from the Ministry of National Defense and Vietnam People’s Navy. In addition to exchange activities, the trip is expected to help improve the capacity and skills, especially in mastering weapons and advanced equipment, of Vietnam’s navy and add valuable experience for Vietnam in organizing international events. More than 60 countries are sending delegations to the international maritime parade held to celebrate the 70th anniversary of the founding of the Chinese People’s Liberation Army Navy. Japan, the Philippines, India, South Korea, France and Russia will also send their ships to the parade, international media reports say, citing China’s Ministry of National Defense. It is expected that Russia will send guided missile frigate Admiral Gorshkov, India, her stealth guided-missile destroyer INS Kolkata and fuel and logistics tanker INS Shakti, and Japan, a light frigate. The U.S. has said it will not have any ships participate, with just one attaché attending the event. Launched in 2011 and 2018, 011 Dinh Tien Hoang and 015 Tran Hung Dao are Gepard-class frigates built by Russia.